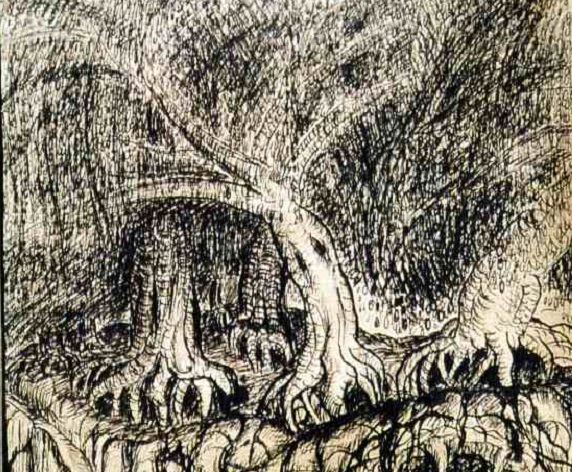 Detail from “Dreamland,” undated pen and ink drawing by Clark Ashton Smith inspired by Edgar Allan Poe’s poem “Dream-Land.” Photographed by Henry J. Vester, image courtesy of the Eldritch Dark website. Prevented from going to high school by various psychological ailments, young Clark Ashton Smith pursued his studies on his own while living with his parents in their remote cabin in Auburn, California. In 1912, when he was nineteen, his writings attracted the attention of San Francisco poet George Sterling, who helped him publish a debut poetry collection, The Star-Treader. Smith’s third volume of verse, Ebony and Crystal, appeared in 1922 and elicited a fan letter from H. P. Lovecraft, beginning a life-long correspondence and long-distance friendship between the two authors. Although Smith enjoyed a brief moment in the limelight as the latest boy wonder of the Bay Area, he abandoned his career as a poet and published little for the remainder of the decade. During a six-year period at the outset of the Depression, however, Smith wrote more than one hundred short stories, and they appeared in such similarly named magazines as Wonder Stories, Amazing Stories, Strange Tales, and (above all) Weird Tales. Nearly all his stories were horror or science fiction, and many of them were set in the fantasy realms Zothique, Hyperborea, and Averoigne. Following the death of his mother in 1935, he again virtually stopped writing and, living alone in his cabin, devoted himself instead to sculpture. I have done another tale since writing you, to round out my third year of professional fictioneering. The story, “Genius Loci,” is rather an experiment for me—and I hardly know what to do with it. . . . It was all damnably hard to do, and I am not certain of my success. I am even less certain of being able to sell it to any editor—it will be too subtle for the pulps, and the highbrows won’t like the supernatural element. Oh, hell. Despite the author’s anxieties, Weird Tales editor Farnsworth Wright took the story immediately and added it to the ever-increasing backlog of Clark Ashton Smith stories he had accepted for eventual publication. After “Genius Loci” appeared in the June 1933 issue of the magazine, H. P. Lovecraft sent along praise in a letter that opened with a characteristically Lovecraftian dateline: “June 14, 1933: Hour when low tide bares that daemon-carven reef wherefrom men avert their glance.” He extolled Smith for having “succeeded in capturing that vague, geographical horror after which I have so often striven.” And, ever solicitous of helping out his friends and acolytes, Lovecraft added a postscript on the outside of the envelope: “I've just lent young Bloch my collection of your sketches. It ought to prove quite a revelation to the kid!” Robert Bloch, only sixteen years old at the time Lovecraft mailed him Smith’s writings, would become internationally famous a quarter century later as the author of the novel Psycho. “It is a very strange place,” said Amberville, “but I scarcely know how to convey the impression it made upon me. It will all sound so simple and ordinary. . . .” If you don't see the full selection below, click here (PDF) or click here (Google Docs) to read it—free! Wow! That was freaky and creepy. I love the ending! The narrator is obsessed, as well. I think he won't be able to resist. This story actually had my heart thumping with intensity. I don't think a story has had this effect on me before. I'm impressed.